England’s Ritchie Blackmore is one of the all time great and admired musicians from rock’s golden era, the 1970’s. As co founder of Deep Purple in 1968 and the founder Blackmore’s Rainbow in 1975, his melodic and tasteful playing is one of the most distinctive and respected of all his peers and beyond. 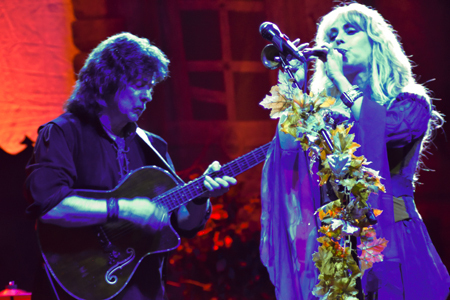 Always interested in many forms of music, in 1997 Blackmore formed Blackmore’s Night with his then girlfriend, singer and former model Candice Night, whom he eventually married. Their group is a is mix of folk, Celtic, classical and medieval music. Blackmore plays mostly acoustic guitar in this group, with the emphasis being on the stellar vocals of Night. They’ve been quite prolific, having recorded ten CDs and touring regularly. This performance was the final stop on their 2018 tour. The set was over two hours, and the music was delivered beautifully. Three excellent female backing singers were present, with one of them able to reach the highest of notes and whose day job is a nuclear power plant technician, as we learned from Night and the woman talking about it on stage. Visually, everyone wore very old fashioned minstrel type clothes, and the stage was adorned with simulated rocks and shrubbery. A neat backdrop was hung with a silhouette of a castle. Night was very engaging and charismatic, speaking to the audience and asking questions of them. For example she explained that the vocabulary of the British has many terms that Americans don’t use, such as the boot of car instead of trunk and other terms that she didn’t initially know upon hearing Blackmore say. Highly attractive, Night reminds me of a younger Stevie Nicks with very similar enchanted, mystic and mysterious qualities. Her lyrics reflect this too, and are very thoughtful, probing and meaningful. In addition to singing, she also plays a small horn instrument. This is a group that takes their music and cause seriously, and do it with great panache, focus and commitment. As the Brits like to say: right, well done then! Catch them when you can.